"The Worldwide Church of Jesus Christ"
"Celebrating 37- Years Of Christian Ministry"
"Christ Centered Education For The Nations"
*Earn Income For Your Ministry Now !! See below for details..
"Celebrating over 37 Years of Conservative Christian Ministry"
Our Presiding Bishop: Dr. Howard M. Sarkela/ USA, offered our first Christian College level educational programs in 1980 in the form of a discipleship training program at the Detroit Christian Guidance Center, Scripps Mansion: 3664 Trumbull Ave. Detroit, Michigan. "We are Celebrating 37 years or Christian Ministry 1980-2017"
Welcome to the Christian Alliance Ministries/ Worldwide Church of Jesus Christ website. We are a World wide, Conservative Evangelical, Religious Order composed of thousands of affiliate Churches , NTS Seminaries and NCU Universities worldwide. Our New Testament style church is The Worldwide Church of Jesus Christ and our goal is to do our part in fulfilling the " Great Commission" of our Lord Jesus, by worldwide Discipleship through Christian Education. Now you can have your own university branch and provide low cost Christian University educational degree programs for your surrounding community. This will lead to increased church membership as well as a substantial increase in your monthly income. "We must preserve the unity of the Spirit in the bond of peace. Therefore, we should be open to and allow affiliation with any Bible centered Church, whose members love Jesus Christ as their Lord and Savior and have a focus on the fulfillment of our Lord's Great Commission". To view our doctrinal position, go to the site topics menu on the left top border. Our Bishop, Dr. Howard M. Sarkela recognized Her Excellency, Gloria Arroyo, President of the Philippines for her legislation regarding Faith and Morals. 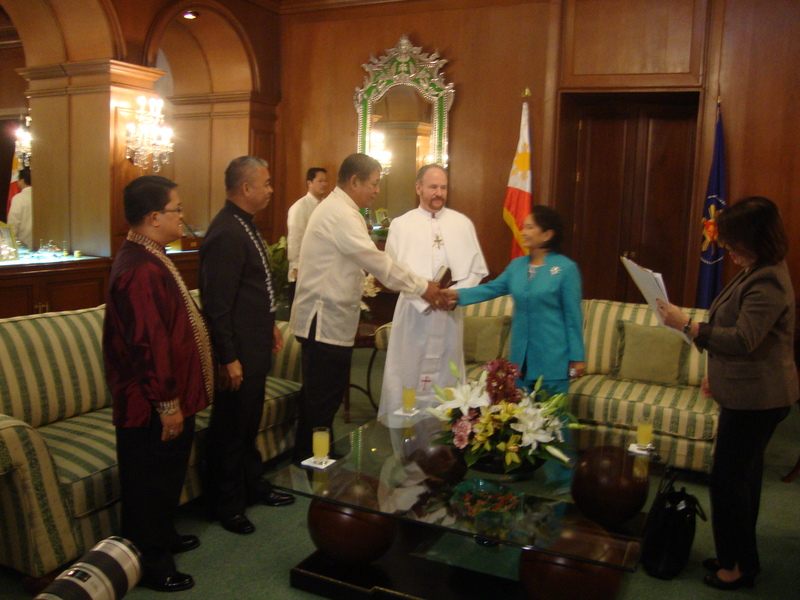 Our Presiding Bishop: Howard Sarkela along with our Filipino Senior Bishop's Seth Lagunda, and Teodoro Garvida, presented an award letter and Honorary Doctorate of Christian Humanities from NCU to Philipine President; Gloria Arroyo at Malacanyan Palace in Manila, Philippines. The meeting was covered by press and television. Even as Martin Luther departed the Catholic Church and formed the original Lutheran Church based on his belief in Justification by Faith alone (Romans 1:17 and Habbakuk 2:4), Bishop Sarkela who is a Finnish American and baptized in the Finnish Lutheran Church "Suomi Synod" of Michigan, departed the Lutheran Church and later formed the Worldwide Church of Jesus Christ (WCJC) because of a life changing awakening in which the Holy Spirit illumined to Bishop Sarkela the simple yet profound literal translation of (Ephesians 2: 8-10) which clarifies that Salvation is by Grace through Faith alone, and not by faith plus works, such as baptism etc., as practiced by some other denominations. This illumination of Biblical Truth by the Holy Spirit, and a further revelation that some Lutheran synods were defiling the Body of Christ, through allowing secular humanistic doctrine to defile the Biblical sanctity of the Church, led Bishop Sarkela to form the "Worldwide Church of Jesus Christ" denomination or preferably; religious order. This historical event in forming the "Worldwide Church of Jesus Christ" as a mainstream protestant, evangelical (non liturgical) religious order, allowed perpetuation of the integrity of the original declaration of the Finnish Lutheran's "Suomi Synod" as well as perpetual continuation of historical "Apostolic succession" as undefiled. So, By the Grace of our Lord, under inspiration of the Holy Spirit and with our Lord's purpose to protect the integrity of His Church and the perpetual integrity of His Apostolic succession from the beginning of His early Church throughout the ages, a new (non-Lutheran) religious order known as the "Worldwide Church of Jesus Christ" was born. Today the WCJC has well over a thousand affiliated Churches and NCU university branches in approximately 40 countries worldwide. The WCJC claims "Sola Scriptura" the Holy Bible alone as it's only doctrinal source and not the humanist doctrines of men, while continuing to recognize the original declaration of the original Finnish Lutheran's "Suomi Synod" of Michigan, which states; "the Suomi Synod maintains as the highest principle of confession that the Holy Word of God is the only rule and standard by which all doctrines of the Church are to be tried and judged". In obedience to the direction given by our Lord's Holy Spirit to Bishop; Howard M. Sarkela, The WCJC seeks to continue the simple pattern of our Lord's early Church, as established by Jesus and His Apostles, prior to the influence of non Biblical tradition and the humanist doctrines of men, while recognizing as our obligation specifically; obedience to the "Great Commission" (Matthew 28:18-20). The WCJC recognizes the Bible as the inspired and infallible Word of God and as the Lord's complete revelation. The lineage as recorded in our WCJC document of historic Apostolic succession is intended as a perpetual undefiled record. The Worldwide Church of Jesus Christ, (WCJC) has well over a thousand of affiliate Churches and Northwestern Christian University branches worldwide. The Lord has used our ministries in the training of thousands of disciples over 37-years of ministry. Watch a VINTAGE chapel service video with our Presiding Bishop; Dr. Howard M. Sarkela as a young minister of the Gospel in Florida, U.S.A.
* Since filming of this service, our ministries have grown from 150 churches and educational branches to over 1,000 worldwide and grown from 20 countries to over 40 worldwide, all by the Grace of our Lord Jesus Christ. "Vintage ChapelService.htm When Our Presiding Bishop Was a Young Minister of the Gospel"
A WORD FOR YOU Today! Lord Jesus we ask your blessing upon the reading of Your Holy Word, mold us Lord, into those servants whom you desire us to be. Empower us by your Word Lord, to share the Gospel, feed your sheep and make disciples of every nation. We make this humble request in the authority of Your Holy name Lord Jesus. Hear our prayer Lord Jesus... AMEN. Christian Alliance Ministries is a worldwide Religious Order, with our main headquarters in the USA. Our Church network is known as; "The Worldwide Church of Jesus Christ." Our New Testament style church ministry is Bible centered, conservative, evangelical and non-denominational. To God Be The Glory, Great Things He Has Done ! We praise our our Lord Jesus Christ, for our continued growth. Our educational and church ministries have expanded to include many thousands of affiliate members worldwide. We expect to reach our goal of ONE MILLION members sooner than previously projected. We have established over 1,000 branches of Northwestern Christian University worldwide. We also now have over 1,000 Churches in affiliation with our ministry's Worldwide Church of Jesus Christ. Our mandate and primary focus is on discipleship through Church planting and Christ centered education. Our goal is to make disciples of every nation. Today, we are fulfilling this goal through all of our ministries and especially our educational ministries, Northwestern Theological Seminary and Northwestern Christian University with locations in USA, Latin America, Europe, Asia, Africa and the Middle East. Visit our FREE online Library and ministry resource center. The largest FREE online library offered by any Internet seminary. We provide access to over 50,000 FREE online books, as well as sermons, audios and periodicals at your fingertips for assisting you in research for sermon preparation and educational assignments. Our state of the art Virtual Library offers FREE E-Books which eliminates the cost of books for our students as well as student from other schools, who use our many free resources. There are FREE Christian e-books, movies, audios, periodicals, daily devotionals, ministry research tools and even a list of online Radio broadcasts available through our library. Our Presiding Bishop; Dr. Howard M. Sarkela, has just been named International Director for TIACT, The International Association of Christian Theologians. TIACT Certification is now available to all of our ministry members. Jesus said, "Go therefore into all of the world and make disciples of all nations, baptizing them in the name of the father and the Son and the Holy Spirit, teaching them to observe all that I commanded you; and know that I am with you always, even to the end of the age." We have hundreds of educational branches worldwide which include degree programs offered by our Northwestern Theological Seminary and Northwestern Christian University. Our goal is to reach every nation through continually forming ministry alliances for the opening of new branches of our Worldwide Church of Jesus Christ, Church Ministry and our Northwestern Theological Seminary and Northwestern Christian University branches throughout the world. Before leaving be sure to browse the site topics list located in the top left border.